Of all of the days of the year, this one is the best. 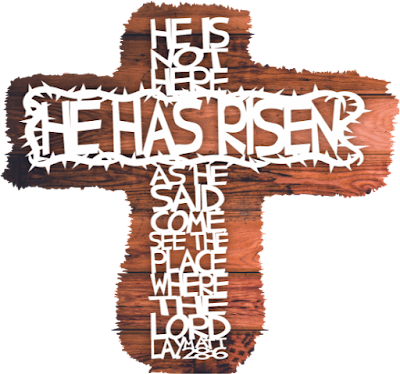 Easter Sunday, celebrating the rising of our Saviour and Lord from the grave. This Easter is extremely special. Years ago we belonged to a wonderful small but close knit church family. Unfortunately, over time, that church family grew smaller and smaller until it finally could no longer function and it closed. That was almost 20 years ago. Since then we have been searching for a new church family. We have attended numerous churches over the years but never quite fit. Back in January we heard of a new church that had started up in our city, Sovereign Grace Baptist Church, and we began attending. It didn’t take long to realize that the Lord had answered our prayers and that this was to be our new church family. Today we become official members of that church when they extend what they call “the right hand of fellowship” to us. I don’t talk a lot about my faith here on the blog, but it is an essential central component of who and what I am, and also of what I do and why I do, and so when important things arise, I will mention them. As far as stitching goes, once more not a lot of that has been happening. This past week, once more I was felled by a bug of some sort...... that’s three this winter.... I’m done, no more please!!!! Since that really bad illness that landed me in hospital for 10 days last April, it seems like it’s been just one thing after another. I am so ready to be done with all that. I’ve mentioned to my husband numerous times that I’m sick and tired of being sick and tired. LOL! And each time, the recovery process takes longer. I suppose it must be part of the getting older thing, less immunity, less resistance and less energy at the best of times, let alone when ill. And of course it doesn’t help when I put myself into situations where I’m working at full tilt way beyond my strength and capacity, pushing myself way past where I should. A crash and burn in those circumstances is almost inevitable, as most of my friends and all of my family know and consistently warn me about. So I’ve been in enforced lay down on the couch and rest mode for the past week. I have done a little bit on the last four blocks for the last border of Leo’s Mane. I miscounted the number I need for this border, so I’m scrambling to find the fabrics that I used. I’ve managed to locate everything except the red. If I don’t find it I’ll have to do some creative substitutions. 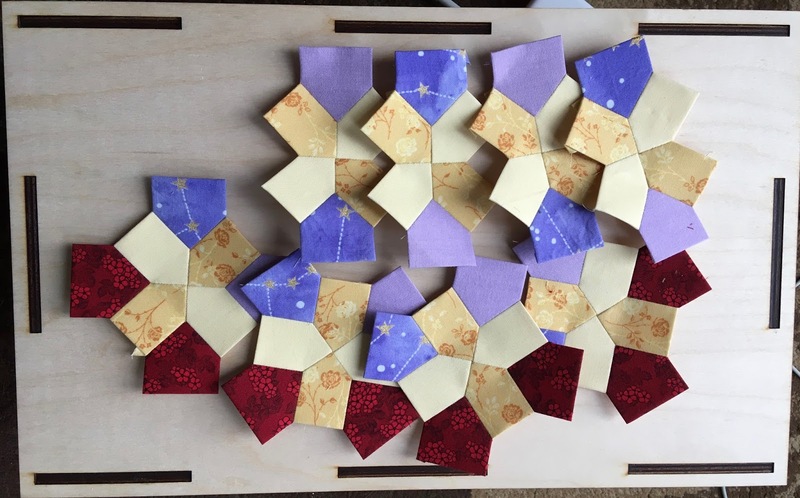 I have the four corner blocks already made. What were missing were 4 side blocks. If I have to, I’ll take the red off the corner blocks and move them to the side blocks, and then add a different red to the corners. At this point, I’m thinking something that is as close to what is already there as possible. But who knows, maybe a flashy contrasting red will work even better. Whatever the case, I have to decide soon, since I can’t go any further on those side blocks without the red. I’m going to post this, link to Kathy’s Slow Sunday Stitching, and then go red fabric hunting. If I don’t get attacked by yet another bug of some sort, these blocks will be done by this time next week, I hope. I am SO sorry to hear that you've been felled by another bug - but, hopefully, you're done with them, right? I'm really glad to hear that you've found your "forever" church family! It can sometimes be hard to find "just the right one" - but it sounds like you're finally home! I've been sick several times since early Dec. I just found out that I have a very nasty sinus infection, and have probably had it (just not nasty till 2 weeks ago) since at least January. This was my first Sunday back in our own church since Feb 11th. We'd visited our son's church, in Alaska, but, life has happened, since we got home, and I hadn't been able to go for the whole month of March. Things just don't seem to go as well when the week doesn't start off with worship. Our church family is very important to us. Glad you have finally found a place for your family. It is a beautiful thing when you find that special church that makes your heart sing. Hope you are feeling well for the remainder of the year! Great to work on some hand stitching. Sorry your sick again.